As the 20th anniversary of the genocide in Srebrenica has turned into a spectacle over the angry crowd towards the presence of Aleksandar Vučić at the commemoration, there is a deeper problem with the public commemoration of the Bosnian or Croatian war. All sites of commemoration remember places where members of one nation was particularly victimized, by it Potočari or Vukovar. The ceremonies, the symbols, the commemorations are national and often religious and reinforce the categories the murders imposed on their victims. People died as Croats, Bosniaks or Serbs, not for being mothers, sons, engineers or animal lovers. However, does this mean that they should be exclusively be remembered as such? The distinct religious dimension of Potočari also makes Muslims of Muslims (as a national category) who were killed for being Muslims, but who might have been atheists or agnostics, as elsewhere across the memorial landscape of former Yugoslavia. This has had two negative consequences. First, there is no common space to remember civilian victims killed for their ethnicity, no matter whether they were Serbs, Bosniaks or Croats. This would make it easier to find space for the shared remembering and acknowledgement. Instead, remembering one set of victims is a political statement about particular claims and thus seen as supporting one or the other narrative. Second, it has made the commemoration of victims as part of nationalist projects and narratives, thus the killing of Serb civilians in Kravica is used to downplay or relativize the victims of Srebrenica. But this is not the only example where the killing of ones own civilians serves to reinforce narratives of national innocence and victimhood. Of course, the risk, some might argue, of a common commemoration of civilian victims might risk forgetting or downplaying that most victims in the Bosnian war were Bosnian Muslims and support a narrative of equal responsibility of all parties to the conflict. 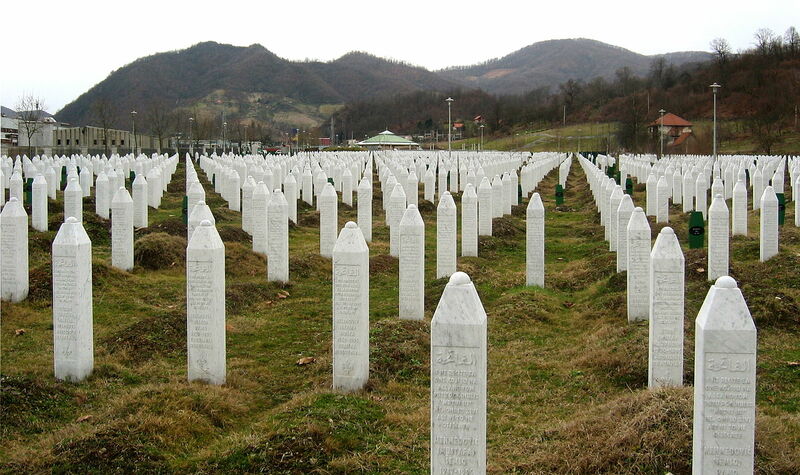 This certainly would be a mistake (according to the Bosnian Book of the Dead, of the nearly 40,000 civilian victims, around 83% were Muslims-Bosniaks, around 10% Serbs and 5.5% Croats) . There is a clear primary burden for war crimes and civilian victims with the Bosnian Serb army, but that should not preclude the ability to acknowledge the other civilian victims of the conflict of which many were also subject of ethnic cleansing. Places like Potočari will exist and have their raison d’etre, and there is great significance and importance for honest acknowledgement of crimes committed by members of one’s own community by politicians at such event (not as Vučic did by first trying to block public commemorations in Belgrade and then opposing the UNSC resolution that led to the Russian veto). Yet, without common places of commemoration there is a risks that the remembering of the past will just reinforce divisions and accept and invigorate the categorization of victims and perpetrators into neatly defined ethnonational groups.